Heating Maintenance | Fresh Air, L.P.
We are well into fall, and even though our temperatures don’t dip as drastically low as they do in other parts of the country, we still have some pretty cold weather to contend with! That being said, the time to schedule Katy, TX HVAC maintenance for your heating system is now! This is a service that should be scheduled on a yearly basis, or biannually if you’re using a heat pump system. There are some basic maintenance tasks you can handle on your own when it comes to your heater. For example, you should change your clogged or dirty air filter every 1-3 months. However, full system maintenance that actually makes a difference in the performance and functionality of your heater requires the assistance of a professionally trained heating technician. Posted in HVAC | Comments Off on Don’t Skip Heating Maintenance! Have you had a central heater installed within the last year? If so, great! Our temperatures may not get as cold as some other parts of the country, but we know all too well that a 40 degree night is nothing to scoff at. So now that you’re equipped with a heater, it’s time to start thinking about maintenance. An annual heather tune-up is vital to its functionality and its safety. It’s never too early, or too late, to start thinking about scheduling this important service, as long as you do so once a year—twice a year if you have a heat pump. Scheduling maintenance before you actually need to use your heating system on a daily basis is the best thing you can do for your system. But what can you actually expect during your first heating maintenance appointment? What Will Heater Maintenance Prevent? As we progress closer to winter, although our temperatures certainly haven’t declined as much as they have in other parts of the country, it is the time of year that we remind our customers that it’s time for heater maintenance. 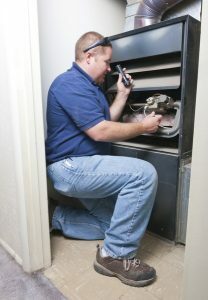 Your heater inspection and tune-up is one of the most useful preparations you can make for your home this time of year. But we understand that it can be hard to understand the benefits of such a service if you don’t know what it actually prevents. Keep reading as we answer this inquiry. Posted in Heating | Comments Off on What Will Heater Maintenance Prevent? Recent temperatures may have you wondering why we are about to discuss your heating system. However, now is actually the perfect time to start considering scheduling a heater maintenance appointment—well before you’ll need the system on a daily basis. Just like any other important appliance in your home, your furnace is expected to function to the best of its ability for as long as possible—which it cannot do without proper maintenance. Even if you have a relatively new furnace, it’s never too early to begin planning to keep it in good working order throughout its lifespan. But are the benefits of furnace maintenance truly worth it? Keep reading and decide for yourself!